American agriculture is unmatched around the world. Yet with this success comes an even greater challenge: Who will replace the half-million farmers and ranchers who plan to retire over the next two decades? Look no further than our next class of America's Best Young Farmers and Ranchers. They are among the best of their generation. They embrace the future of agriculture and are developing the technical and managerial skills to build their own successful businesses. Angelo Erickson doesn’t believe in participation ribbons. He values the smoke, grease and black dirt of farming. It was May 10. Angelo Erickson has finished planting corn the day before and an inch of rain fell overnight. "Man what a nice day today, it doesn't get any better than this," he says for the second time that morning, recalling springs past. "My dad would take me planting. You'd see the wind blowing, the dust blowing. You could smell the diesel and the grease, the dirt in the air. I love grabbing the dirt, with that springtime moisture in it." He points to a place in the grass ahead. "Calf born last night in the storm," he says, finding it tucked down among the long blades. The newborn is an addition to a small herd of miniature Herefords Angelo's young boys, nine and five are raising. They are "real farm kids," Angelo says of his sons. "I'm trying to show Alex and Aiden how to earn some money and learn to turn a profit. I want them to have a good work ethic." Work is one word of high value to Angelo. "I don't believe in participation ribbons," he says. "I coach baseball and I preach hustle and hard work. If you get beat, you practice harder and you play harder." Angelo's notion of hard work is built on the example of his father, Dennis, 62. "I don't think anyone can outwork him. He's a farmer. He's a mechanic. He is a carpenter. The guy can do it all." And, that notion is reinforced by the work ethic of Derek Jeter, the now retired, 20-year veteran shortstop for the New York Yankees: five World Series rings, five Gold Glove Awards, 3,465 hits—a long list of accomplishments. "Hustle. Hard work. He didn't let anyone outwork him," says Angelo. "Every year you have to step up. You can't give up. You'll miss the next great opportunity." Angelo is the son of Dennis and Yolanda, she of Hispanic descent and raised in Los Angeles who inexplicably made her way to Tarkio, Missouri, with her parents. Dennis, blond-headed and good looking, was enticed at his first sighting of Yolanda. They've been married for 40 years. Their son dreamed of playing professional baseball, but his gift with a bat and ball never brought him to the plate in a big league park. Angelo turned to farming and he has never regretted it. Angelo is animated, with just enough arrogance for the life of a young, 21st Century farmer, his wife, Lori says. Sitting still is not his first choice. "I have a big competitive edge in me. I love competition. I want to grow and go hard," he says. "I've taken a lot of risks and it has worked out." He notes with some pride his father has never co-signed a note for him. Dennis confirms it. Angelo and Dennis farm well together, his son says. "My dad has always been my biggest critic and my best teacher," he says. Father and son are full-time white corn producers, two growers in a very small fraternity. Only 750,000 acres of white corn are growing annually in the U.S. Running three efficient, Lexion 740 TT combines, they harvest up to a million bushels of white corn a year. Much of it is processed into tortillas and snack foods, such as corn chips. White corn is the predominant crop on the Erickson farm because of a suggestion from Yolanda. She was familiar with the white corn food products common in California. Dennis, raising hogs at the time on a small acreage, knew scarcely anything about it. But with encouragement from his new wife, he scared up some willing buyers and soon began shipping the brand new crop to California. The business grew large. The Ericksons' were soon sending 25 railcars a week to Los Angeles, some to Los Vegas and Chicago and bagged to South Korea. There have been customers, too, in Canada, Europe and New Zealand. "All I know is white corn," Angelo says. "I wouldn't be able to farm without white corn." The money can be enticing. When father and son were bagging their non-GMO crop for export to South Korea one year they were earning an 80 cent to $1.50 per bushel premium. Erickson Farms is not a multi-generational operation. "I love those stories about farms that are five generations, but that isn't us," explains Angelo. "I'm generation and a half. I've been fortunate and I have great landlords. They have the same vision I do. They care for the ground just as I do. They are like family." Angelo manages his father's 4,000 acres. 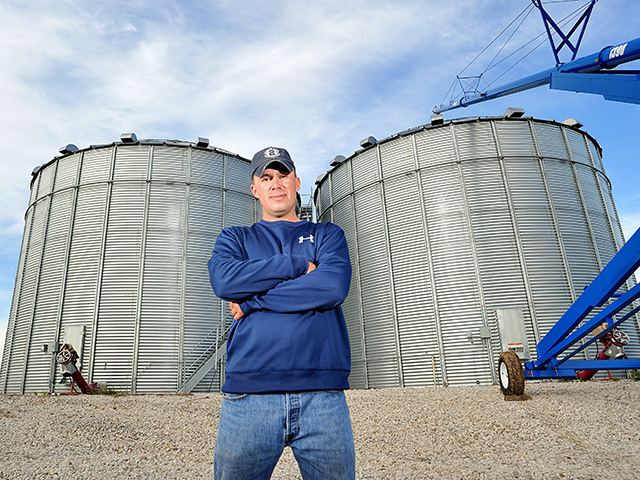 His AE Farms is 4,200 acres—746 acres are Angelo's—and sits near Tarkio, in the far northwest corner of Missouri. Away from the bottoms, there is a predictable roll to the land, like smooth swells on an ocean. Tarkio is home to the "Missouri Corn King," as David Rankin was known. Before Rankin died in 1910, he had amassed 30,000 acres, 12,000 head of cattle and 25,000 hogs. He once raised a million bushels of corn in a single season, much of it from a single 6,000-acre field. Today, the Ericksons' work large pieces of Rankin's land. The family once operated a white corn processing and cleaning facility at Phelps City, Missouri. But the Missouri River flood of 2011 all but destroyed it. And, with the exception of Mexico, the loss has cost them all of their overseas business. The money they made in white corn was largely due to their ability to clean their own crop. Angelo says it would cost $1 million to put the facility back into running order. It's money he and his father can't risk on a building in the Missouri flood plains. Dennis hopes one day to build a major white corn processing facility near Tarkio to produce tortilla chips. The project awaits investors and a clearer picture of wholesale opportunities. The future awaits Alex and Aiden, too. Angelo has big expectations for his sons. "I hope they hit it hard." No matter their career choice, he wants the boys to be good people. "There's something to be said about kids growing up as farm kids. But whatever they end up doing, I hope they do it to their best, put all their effort into it, just as my mom and dad taught me, to do their part in this world."